An attorney for Florida shooting suspect Michael Drejka says it's too early to say if he will invoke Florida's controversial "stand your ground" statute in his defense. "At this point it is too premature to decide if we’re actually going to rely on the 'stand your ground' statute," Tampa attorney Bryant R. Camareno told NBC News Wednesday evening. Drejka, 48, is charged with manslaughter for fatally shooting 28-year-old Markeis McGlockton, a father of three, in a July 19 dispute over a handicapped parking space that was captured on security video. The shooter, who had confronted the dead man's girlfriend over the parking spot, was pushed to the ground by McGlockton, then paused for a moment before opening fire at a Circle A convenience store in Clearwater, the video shows. 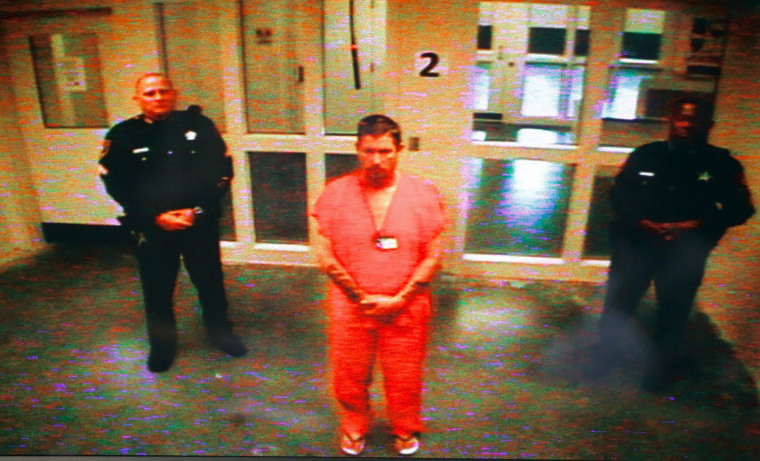 It appeared that McGlockton was stepping away as he saw the gun brandished. Drejka has been accused of confronting people over using handicapped spaces in the past, according to police documents obtained by NBC News. Florida law justifies deadly force in cases where it would "prevent imminent death or great bodily harm." Victims do not have an obligation to flee, but an aspect of the law approved last year means that prosecutors must prove deadly force was not justified — rather than the defense show that it was. While prosecutors declined to file a murder case against Drejka — there was widespread speculation that he had a stand your ground defense on his hands, and police didn't even immediately arrest him at the scene — McClockton's family was thankful when the manslaughter charge was filed Monday. "We are very appreciative that the state moved fast in this case," Kelly McCabe, an attorney for the family of McGlockton, said at a news conference Tuesday. Camereno indicated that Drejka, who is being held in lieu of $100,000 bond, is eager to tell his side. "He would very much like to be heard," the lawyer said.